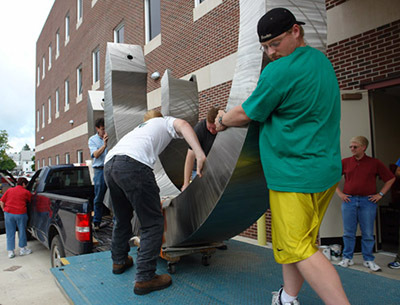 On Wednesday, September 13th, students moved the 800-pound "Echo Spiral" sculpture to its permanent home in the Lawson Computer Science Building. 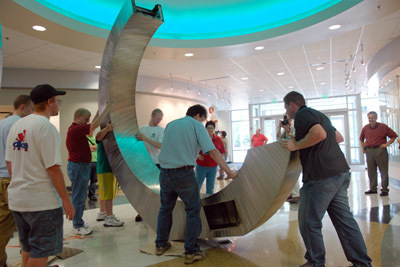 Sculptor John Mishler delivered the large metal spiral in two 400-pound pieces. The pieces were carefully wheeled into the lobby area and assembled directly in front of the main entrance. 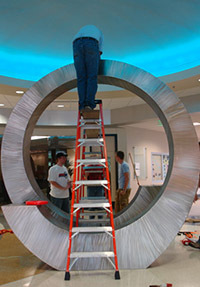 Mishler worked for three months to construct "Echo Spiral" from stainless steel. He brushed and textured the surface with a hand-held sanding disc. Mishler constructed the piece in two parts so that it would fit through the doors of the Lawson building. He created a "trap door" at the top of the sculpture that allowed him to bolt the two pieces together on the inside once they had been situated. The "trap door", coupled with the rhythmic texturing, allowed the two pieces to merge seamlessly into one flowing spiral. A number of students assisted Mishler in moving spiral into the commons. Sophomore MIke Nichols was one of the student helpers who assisted in the move. 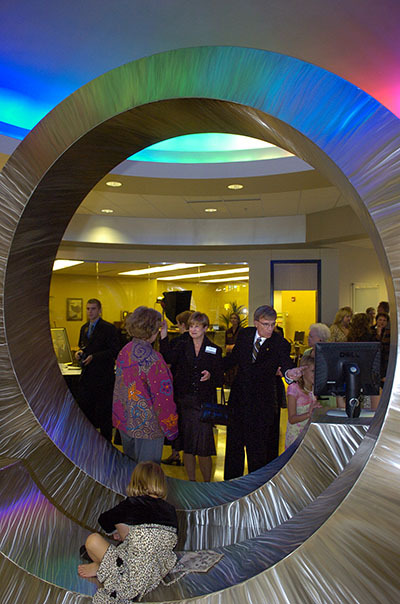 Nichols remarked "It was definitely interesting moving the sculpture because it was awkward and it required a lot of teamwork to get it through the doors." The pieces had to be turned on their sides, strapped to carts, and then rolled and rotated to maneuver through the narrow opening. Mishler said, "It's nice that the students who helped move it will be able to come back years later and remember that they helped assemble this sculpture." 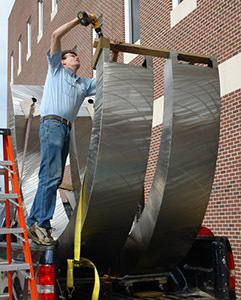 Mishler is a nationally-renowned metals sculptor based in Goshen, Indiana. He specializes in large-scale sculpture composed of common metals such as aluminum, copper, and stainless steel. He has created commissioned pieces for numerous companies and institutions, and his works can be found in collections throughout the United States, Canada & the South of France.